Do you already love lifestinks safe, effective deodorant and you want to take it with you everywhere? Complement your refillable stainless-steel decanter with this convenient, sealable everywhere. It’s perfect to throw in your gym bag, take camping or carry on a flight. 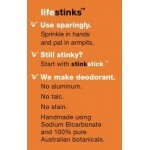 Lifestinks is neither liquid nor gel – very TSA friendly. Included in this recyclable container is a four-month supply of our all-natural dry deodorant. 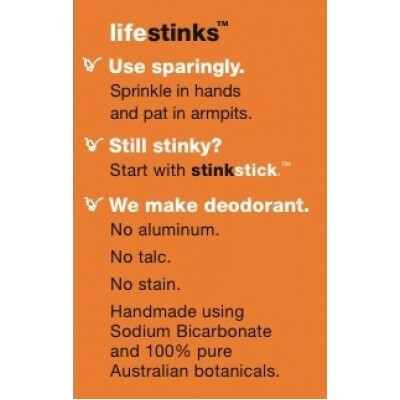 Made with just three simple ingredients – aluminum-free sodium bicarbonate, tea tree oil and cedarwood oil – lifestinks offers 100% coverage without any toxins. Extra-strength options are hard to come by with natural deodorant. 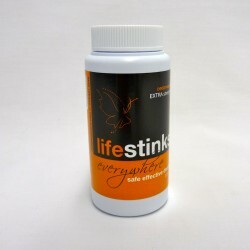 Lifestinks' unmatched protection is a result of our high-quality oils. We harvest wisely and selectively within the melaleuca species to achieve increased anti-fungal and anti-bacterial properties. Cedarwood, when combined with tea tree, elicits a warm, buttery, woodsy experience. Like regular-strength lifestinks, our extra-strength deodorant provides gentle dryness while allowing for healthy perspiration. • Seals. Bring it with whenever you shower away from home. • Is recyclable. Drop it in the recycling bin when empty. Also available in cedarwood regular strength. Interested in a clean, vivid, fresh sensation? Consider lavender regular strength and lavender extra strength. Are you a big stinker? It’s not our fault. Add in our stinkstick deodorant booster. Ingredients: Aluminum-free sodium bicarbonate, cedrus atlantica (cedarwood), and melaleucas (incl. tea tree).